Tam W’s Art Direction: This is a great work of fantasy, so naturally we want it to look as retro, cliched and formulaic as possible. I’m talking men in tights! If you do decide to depict a wizard turning into a bird, don’t forget to catch him in the act. And make it man-sized, never mind what the novel says! Changing him into a bird doesn’t sound so bad (ask the previous recipient of the spell who, now a crow, walks away from the scene, but HALF a bird is a bit of a problem. He’ll never get of the ground with those legs. I’m imagining him taking off and yelling “BIIIIRD-MAAN!” as he flies towards the sun’s energy-giving rays. The problem the city gents had with marketing the book was distinguishing it from all the other “Wizard” and “Earthsea” related titles. The glut of them, if you will. They wanted to show this was a “Wizard of Earthsea”. Not the “Wizard of Earthsea”. Not any happenstance “Wizard of Earthsea”. Their solution was to make the “a” bigger than anything on the front–the author’s name, the Penguin logo–and also obscure it behind ornamental vinework. Best episode of medieval blind date ever! Note how big the Penguin Books penguin’s head is getting…. Oh my God, it’s going to explode! 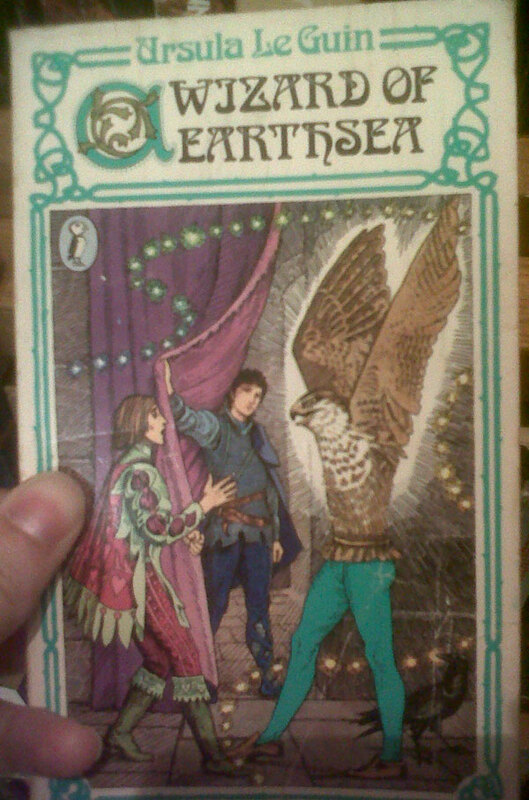 This cover is the reason I didn’t discover Earthsea until I was 21. One day someone will answer for this. A penguin with a large head is called a puffin. A children’s book from Penguin is called a Puffin. A rip-off Penguin biscuit from Asda is called a Puffin. Yes, I have this one! It was my sister’s first encounter with Le Guinâ€¦strangely, she didn’t seem put off by the cover, despite her artistic training. I am confused. No one is carrying or holding a sword, dagger, mace, quarterstaff, jousting lance, spear, morningstar, quarterstaff, sling, bow, crossbow, catapult, battering ram, or glowy wizardy hand thingy in what I assume is a cover for a fantasy novel. I sense I have offended the ornithological community. I was distracted by the a. While considerably goofier-looking than his previous attempts at creating perfect beings, Doctor Frankenstein’s newest failure was, nonetheless, every bit as belligerent. Also I think the string lights are an excellently hokey touch. He’s half man and 90% bird, kinda like a centaur is half man and 80% horse. Oi! Are you looking at my bird?!? We have sparrowhawks regularly nesting in my back yard. The smallest raptor, they’re cute little blue-gray things. THAT looks more like a golden eagle! That isn’t a string of Christmas lights–it’s a string of tings. Actually, now that I look at it again, maybe a hawk is emerging from a rift in space in front of Ged. That could be what’s going on there. Didja see the legs on that bird?? Which is a worse way to be a half-bird, this or the other way round? I’ll leave that question to the philosophers. @anon: how about left vs. right?